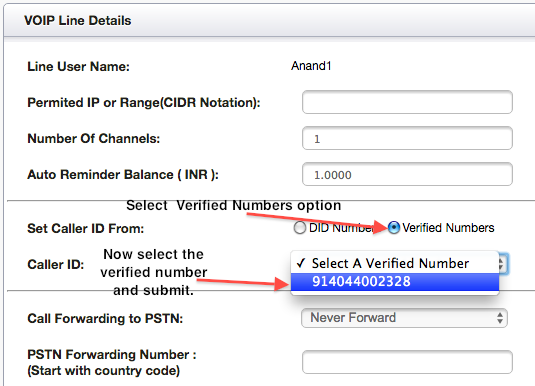 You can assign short easy to use 2 digit, 3 digit or 4 digit unique extension numbers to each one of your VOIP Lines in your DoorVaani account. 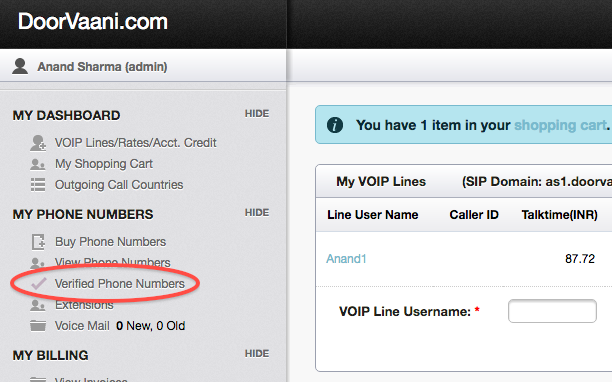 You can call other VOIP Line users in your DoorVaani account by simply dialing their short extension number. 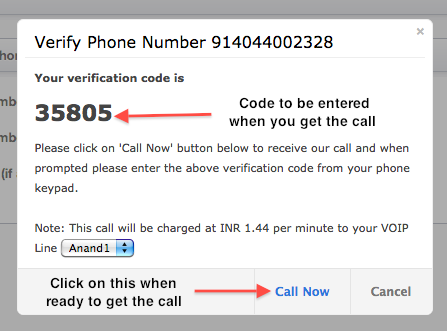 You can also call your own extension number to easily reach your Voice Mail box. 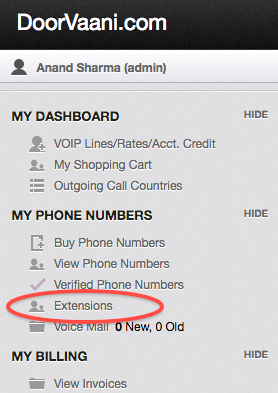 Once you are on the extensions page, simply enter your desired extension number(s) to your VOIP Line(s) and save your updates. Even if you have only one VOIP Line in your account, it is still advisable to assign an extension number so that you can easily reach your Voice Mail box. How to set auto renewal of phone numbers? You can set your phone numbers to renew automatically month after month and charge the renewal cost to your available account credit. Once set the auto renewals happen 7 days before the expiry date of your phone number if sufficient credit to pay for the renewal cost is available in your account credit. On auto renewal you will get an email informing you of the completion with a link to the auto generated invoice. Set your phone numbers to auto renew to relieve yourself of manually renewing the numbers. This blog post explains how to set auto renewal of your phone numbers. Please log in into your DoorVaani account, if not already logged in, and then click on the “View Phone Numbers” menu under “MY PHONE NUMBERS” on the left hand side. Please see the below image. In “My Phone Numbers” page, please see the “Auto Renew?” column of drop-downs with options to set the Auto Renew to “On” or “Off”. Please select the option “On” and say OK to the confirmation message. This will set your phone number to renew automatically. Just in case you do not want the auto renewals you can come back to this page any time and set the Auto Renew to “Off”. How to use DoorVaani Voice Mail? Each of the VOIP Lines in your DoorVaani account comes with its own voice mail box. Your callers have the option of leaving you a voice mail message in the event you are unavailable to take the call or busy on other phone lines. This blog post explains how to make the best use of your voice mail. How to access voice mail setup options page? 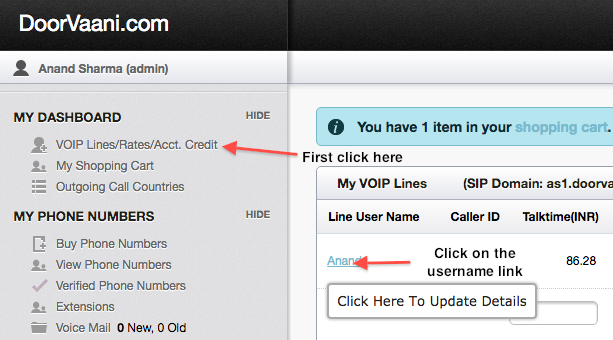 Please login into your DoorVaani account and then click on the “Voice Mail” menu as shown in the above image. How do I know my voice mail password? Voice mail box is automatically created when you create your VOIP Line. You would need a password to enter your voice mail box to listen to your messages or to administer your voice mail options. A four digit numeric password is created when your mail box gets created. You can see this password that was created for you on the “Voice Mail” settings page. Voice Mail password shown on the Voice Mail settings page. Just in case you do not want to have the Voice Mail service on your VOIP Line you can simply “disable” it by selecting “Disabled” in the “Voice Mail Enabled?” drop-down box. Please see the image above. When a new voice mail message arrives in your voice mail box, you will be email notified on the email id that is set up in the “Notify by E-mail Id” input box. By default this email id is set-up same as your DoorVaani account login e-mail id. You have the option of changing this email id as per your needs. Just in case you do not want to be email notified simply blank out this email id input box and then hit the update button. How to listen to the Voice Mail messages? There are two ways to login into your voice mail box and listen to your voice mail messages. From your device, registered in DoorVaani network, you can dial your own extension number or your own DID Number if you have one, or your alpha-numeric VOIP Line username. 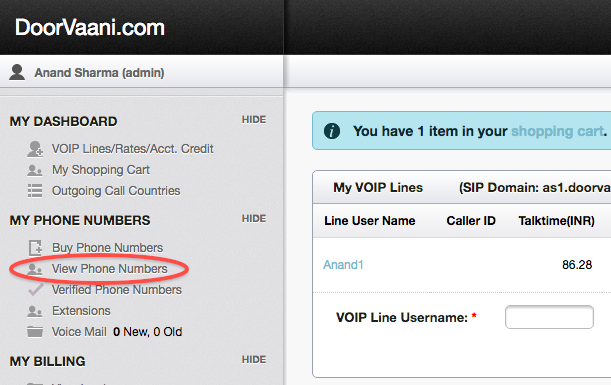 If you have not yet associated an easy to use extension number to your VOIP Line you can do so now by visiting the extensions page accessible from the left side menu. Once your call is connected you will be prompted to enter your voice mail password. On successful login you can follow the menu options read out to you and listen to your voice mail messages. If you have a DID Number, you can call your DID Number from any other network or from PSTN and while your voice mail greeting is playing, you should enter ‘*’ (star key) to hear the password prompt. After entering the correct password you will be presented with the same voice menu options as above and you can listen to your voice mail messages. How to record custom greeting messages? You can record your own custom greeting messages, one for unavailable status and one for busy status. While in your voice mail box, please select option 0 (zero) for Mailbox Options and then select option 1 to record your ‘unavailable’ greetings message and option 2 to record your ‘busy’ greetings message. You can also record your name by selecting option 3. If you have not recorded your unavailable greeting or busy greeting but have recorded your name, the voice mail system will play a generic message: “Recorded name is not available.” or “Recorded name is on the phone.” as appropriate. How to change my voicemail box password? Login into your voice mail box using your current password and then select option o (zero) for Mailbox Options followed by option 5 for changing your password. You can record a temporary greeting and if it exists, it will always be played instead of your “busy” or “unavailable” greetings. This could be used, for example, if you are going on vacation or will be out of the office for a while and want to inform people not to expect a return call anytime soon. Using a temporary greeting avoids having to change your normal unavailable greeting when you leave and when you come back. To record a temporary greeting, please select option 0 (zero), then option 4. 1. Listen to new messages (the default) or listen to old messages if there are no new messages. 0 (zero) Mailbox options (see below). Mailbox Options in the Main Menu: Pressing 0 (zero) from the main menu will present the mailbox options menu. 8 Forward the message to another user.